This Thursday will mark the ninth year I’ve handled the cooking duties on Thanksgiving. I’m not complaining—I enjoy cooking, I like the challenge of putting together a meal for half-a-dozen (or more) diners, and it gives me the opportunity to rule over my kitchen like an iron-fisted dictator. After all these years, I’ve pretty much got the preparation, cooking, and serving down to a science. Still, I’m always looking for ways to step up my game. The App Store offers an assortment of apps that aim to make your Thanksgiving dinner run as smoothly as possible. From dinner planning to recipes to timing how long you should keep that bird in the oven, iPhone and iPod touch users have plenty of would-be Turkey Day companions. But which apps will have you giving thanks, and which ones will leave you cursing to the heavens? Abbreviated Schedule: iFeast aims to help you plan out your cook and prep times, but the app doesn’t give you a good at-a-glance look at what you need to be doing. On the planning front, iFeast: Thanksgiving from Digital Laundry looks to help you synchronize your meal’s prep work and cook times so that your gravy hasn’t cooled off by the time the mashed potatoes are ready. The pleasant-looking app comes preloaded with four menus, each one scheduled so that you can get your meal to the table by 6 p.m. You can also enter your own recipes to build your own schedules and menus. You can even use iFeast’s settings to send you push notifications for when it’s time to get cracking on those cranberries. Unfortunately, there are design and implementation issues with the $3 app. The otherwise useful schedules for the pre-assembled menus are arranged in reverse chronological order, meaning the stuff you need to prepare first is at the bottom of a very long list. You’ve also got no way to tick off tasks as you complete them. iFeast cuts off the names of activities in the schedule—baking homemade rolls, for example, appears as “Start: Cook Homemad…” on my iPhone screen, which is not very conducive to at-a-glance scheduling. The app has some clever icons in its Recipe Details screen for turkey, side dishes, potatoes, and so forth; perhaps incorporating those icons into the schedules would have given cooks a more easy-to-navigate to-do list. Entering your own recipes into iFeast is a tedious process, which becomes especially problematic if you need to edit data; despite there being an edit button in the recipes tab, I could find no way to change or add to recipes I had already entered. You enter prep time and cook time when you enter a recipe, but that information doesn’t transfer over to scheduling or menus—when you’re trying to plan out cook times, you’ll have to enter that data all over again. There also doesn’t seem to be a field for entering ingredients, rendering the app’s shopping list feature fairly useless if you’re preparing your own menu. Not that iFeast’s shopping list is that well thought out in the first place. You’re restricted to the items preloaded into iFeast. Want to use vegetable broth for brining your turkey? iFeast only lets you add chicken broth to your shopping list. Quantities of items are also in set amounts—cups for flour, brown sugar, and chicken broth, teaspoons for ginger, and so on. It’s as frustrating as it is inflexible. Party Pooper: Thanksgiving Party’s party planning information is poorly organized, making it hard to get to the app’s meager advice. If iFeast adds unnecessary steps to planning out a Thanksgiving meal, at least it provides some direction. Thanksgiving Party from PTAJ Marketing offers no help at all. 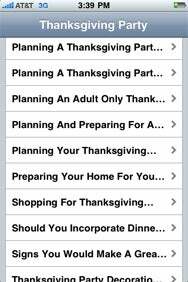 The apps lists a series of ideas for organizing a holiday get-together—planning a formal Thanksgiving party, a Thanksgiving party for kids, shopping for supplies, and so on. However, the app doesn’t organize these different topics into groups; instead, you get a list of topic headers, most of which are cut off by the iPhone’s screen. Tap on a topic to get suggestions and advice that are so vague as to be useless. Avoid this app at all costs. Post Imagineering’s Thanksgiving Recipes and 7Zillion’s Thanksgiving Dinner both look to inspire you with ideas for what to cook come Turkey Day. They would probably do a better job of inspiration if they included photos with the recipes. As it stands, both apps feature bare-bones lists of recipes. Tap on one to get ingredients and preparation instructions. Bare Bones: Both Thanksgiving Recipes and Thanksgiving Dinner (pictured here) take a minimalist approach to giving you menu ideas. The real downside to both Thanksgiving Recipes and Thanksgiving Dinner is that the recipes are more or less stuck on your iPhone. I don’t know about you, but I’m not exactly eager to reach for my iPhone’s touchscreen if I need to know when I should put the havarti on the potato and cheese gratin after my hands have been handling foodstuffs. I was able to use the copy-and-paste functionality in the iPhone 3.0 software to copy recipes from both apps, paste them into Notes and e-mail them to me for later printing, but it seems like these kinds of apps should have that sort of functionality built-in. Thanksgiving Recipes offers 15 recipes featuring turkey and side dishes; Thanksgiving Dinner features just eight. Another mark in Thanksgiving Recipes’ favor: it gives you some ideas for what to do with the leftover turkey. But really, neither app offers anything you can’t get from a food Website or from the online archive of your local newspaper’s food section for free. So would-be chefs looking for some iPhone-delivered inspiration are out of luck, then? Not at all—Thanksgiving Dinner Recipes from Feather & Moor is a well-assembled collection of 60 or so recipes that can serve you well at Christmas, Thanksgiving, Boxing Day, or any occasion when people arrive at your house expecting you to serve them dinner. Picture Perfect: Thanksgiving Dinner Recipes (and the slimmed-down Turkey Recipes) provides a picture of each recipe, so you can get an idea of what you’ll be cooking. Each recipe in the Feather & Moor app includes a big picture of the dish along with a brief description so that you know what you’ll be cooking. Tap the Instructions button for a list of ingredients and steps for preparing the dish. A heart icon adds the dish to your favorites, while a shopping cart icon will create a shopping list of the ingredients you’ll need to make the recipe. You can add your own recipes, too, and while the process of tapping out the instructions for intricate entrees on the iPhone’s keyboard can be a bit of pain, Thanksgiving Dinner Recipes offers a bit of a reward. If you enter in ingredients and separate each one by a comma, you’re able to tap the shopping cart icon to generate a shopping list made up of the ingredients you’ve selected. It’s a pretty slick feature. You can search through recipes by flipping from picture to picture or searching by category. 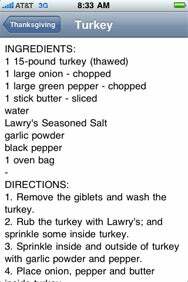 Thanksgiving Dinner Recipes includes a number of turkey recipes, including meals aimed at smaller holiday gatherings where a 14-pound bird would be overkill as well as suggestions on what to do with the leftovers. (Turkey chowder, anyone?) The app has a few (though not many) vegetarian suggestions as well, should your dinner guests include anyone not keen on roast beast. Thanksgiving Dinner Recipes has a quirk or two. Flipping through recipe pictures isn’t as smooth as it should be—on occasion, you’ll get a blank screen as the app tries to keep up with your finger flicks. As with the other recipe apps, there’s no easy way to get the cooking instructions off your iPhone and onto a printed page. But overall, this is a solid app and clearly the class of the App Store’s Thanksgiving offerings. Feather & Moor also offers Turkey Recipes, which strips down the app to two dozen or so dishes incorporating poultry. It’d be a fine choice for users who’ve already settled on their side dishes but are less confident when it comes to cooking turkey, but the main Thanksgiving Dinner Recipes app is a more thorough offering. Is It Done Yet? 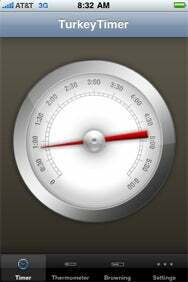 : TurkeyTimer can estimate how much longer your bird needs to stay in the oven, though that analog timer is not easy to read. Let’s wrap things up with two decent apps that are ultimately undone by the limitations Apple imposes on third-party apps. Both GrillTimer from Ayefon.com and TurkeyTimer from ID345 aim to help you master cook times. They both have their own strengths and weaknesses, but they’re limited by the inability to fully run third-party apps in the background. TurkeyTimer draws upon algorithms from sources that include Essentials of Cooking and The New Doubleday Cookbook to figure out how long it will take for your turkey to cook. You enter the weight of the bird and pick a desired internal temperature (145 degrees cooking in a 325-degree oven or 180 degrees in a 350-degree hotbox), and TurkeyTimer calculates the cook time. You have the option of adjusting for basting and stuffing if you prefer those unsavory options. (Note: The author of this review is a card-carrying member of the anti-stuffing camp.) The app displays an analog watch that counts down the cook time, along with screens that show the estimated temperature and browning of your bird. “Estimated” is the key word in that sentence. 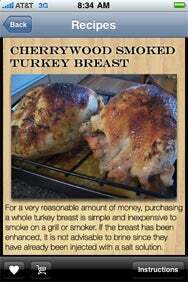 Every oven is different, and not every turkey cooks precisely at 20 to 30 minutes per pound. Even the makers of TurkeyTimer tell you to use the app in conjunction with an actual thermometer to ensure your bird doesn’t wind up undercooked or a dry wasteland of flavor. Personally, I’d never cook a turkey without first sticking a trusty probe thermometer into the breast meat, so that I can remove the bird when it reaches 161 degrees, per the instructions in this excellent turkey recipe. But that’s not the biggest problem with TurkeyTimer, nor is it the decision to use a nifty-looking analog timer when a digital readout would be easier to read. (I also had problems with the app crashing when I tried to set cook times during my testing, but your mileage may vary.) Rather, it’s the fact that you have to keep the app open to get any use from it. Oh, TurkeyTimer will keep counting down if you leave the app to answer a phone call or check your mail or do whatever it is to pass the time while your turkey is browning. But you need to have the app open when time winds down in order to hear the alarm. (It’s the sound of a turkey gobbling by default, though you have other choices, including a vibrate option.) Leaving an app open for the two-to-three hours it might take to cook a turkey is a recipe for draining your iPhone’s battery. A Lot of Irons in the Fire: With Grill Timer, you can keep a running countdown of cook times for up to four dishes. TurkeyTimer is really useful for cooking turkey, and nothing else. Grill Timer has uses beyond the holidays, though it’s plagued by the same inability to run in the background. Like TurkeyTimer, Grill Timer will keep ticking away if you leave the app to do other things on your iPhone or iPod touch. And like TurkeyTimer, you’ll never hear the alarm on Grill Timer unless you’ve got the app open. That’s a shame because Grill Timer could be a very useful cooking tool. 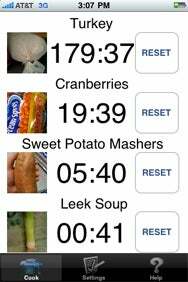 The app provides four separate timers—very handy if you’re cooking multiple dishes at once and have run out of egg timers for tracking how long the potatoes have been simmering or the rolls have been baking. You enter the time (in minutes and seconds), and you can even assign a picture from your iPhone’s camera roll as a helpful visual cue. The developer made a few decisions I question. Grill Timer’s alarm—a chime that frankly I would have trouble hearing in a noisy kitchen—sounds for only three seconds, and then it stops. Forever. In the app’s release notes, the developer says he was aiming for a timer that stopped without requiring him to touch his iPhone. That’s a reasonable request, for his purposes at least, but when I’m cooking, I want an alarm that keeps sounding in case I didn’t hear it the first time. An option for altering the alarm sound would also be a nice addition. These changes would certainly make GrillTimer a better app. But it won’t rise to the class of indispensable until it and other timer apps are able to work completely in the background. When that happens, all iPhone users will have cause to give thanks.